The patients were evaluated functionally using Lysholm knee scores [Table 1]. The mean preoperative Lysholm score in Group TT and AMP were 53.54 (range: 38–66) and 55.19 (range: 38–66), respectively, and the two groups were comparable in terms of the mean score (P = 0.87, CI − 22.59–19.29, and Df 48). The mean Lysholm score at 1-year follow-up in Group TT and AMP was 82.04 (59–100) and 82.65 (69–100) which were comparable in terms of the mean score (P = 0.95, CI − 22.65–21.43, and Df 48). However, there was a statistically significant improvement in clinical scores as compared to preoperative scores in both groups. TT (P = <0.001, CI − 32.16–−24.84, and Df 23) and AMP (P < 0.001, CI − 32.08–−22.84, and Df 25). The overall postoperative Lysholm score of 50 patients (both TT and AMP groups) was 82.35. At the final follow-up of 1-year, the AMP group had a mean Lysholm score of 82.65, whereas in the TT group, it was 82.04. These differences in the functional outcome between the two groups was not significant as analyzed using the independent t-test. 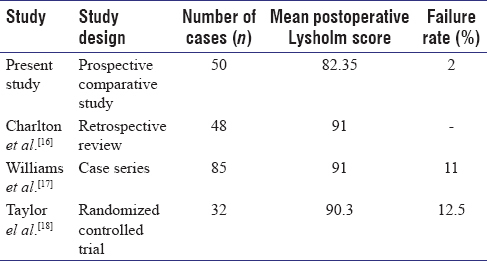 This result of our study is similar to the various other studies which also have documented similar results in terms of functional outcome while comparing the two groups.,,, However, on comparing our scores to other studies,,,, we found a lower postoperative Lysholm score [Table 2]. This functional scoring system being subjective, consideration should be given to the fact that many of the personnel may not want to return to vigorous physical activities due to personal reasons. Marchant BG, Noyes FR, Barber-Westin SD, Fleckenstein C. Prevalence of nonanatomical graft placement in a series of failed anterior cruciate ligament reconstructions. Am J Sports Med 2010;38:1987-96. Siegel MG, Barber-Westin SD. Arthroscopic-assisted outpatient anterior cruciate ligament reconstruction using the semitendinosus and gracilis tendons. Arthroscopy 1998;14:268-77. Yau WP, Fok AW, Yee DK. Tunnel positions in transportal versus transtibial anterior cruciate ligament reconstruction: A case-control magnetic resonance imaging study. Arthroscopy 2013;29:1047-52. Clockaerts S, Van Haver A, Verhaegen J, Vuylsteke K, Leenders T, Lagae KC, et al. Transportal femoral drilling creates more horizontal ACL graft orientation compared to transtibial drilling: A 3D CT imaging study. Knee 2016;23:412-9. Osaki K, Okazaki K, Matsubara H, Kuwashima U, Murakami K, Iwamoto Y. Asymmetry in femoral tunnel socket length during anterior cruciate ligament reconstruction with transportal, outside-in, and modified transtibial techniques. Arthroscopy 2015;31:2365-70. Liu A, Sun M, Ma C, Chen Y, Xue X, Guo P, et al. Clinical outcomes of transtibial versus anteromedial drilling techniques to prepare the femoral tunnel during anterior cruciate ligament reconstruction. Knee Surg Sports Traumatol Arthrosc 2017;25:2751-9.
de Abreu-e-Silva GM, Baumfeld DS, Bueno EL, Pfeilsticker RM, de Andrade MA, Nunes TA, et al. Clinical and three-dimensional computed tomographic comparison between ACL transportal versus ACL transtibial single-bundle reconstructions with hamstrings. Knee 2014;21:1203-9. Lysholm J, Gillquist J. Evaluation of knee ligament surgery results with special emphasis on use of a scoring scale. Am J Sports Med 1982;10:150-4. Mirzatolooei F. Comparison of short term clinical outcomes between transtibial and transportal transFix® femoral fixation in hamstring ACL reconstruction. Acta Orthop Traumatol Turc 2012;46:361-6. Arnold MP, Kooloos J, van Kampen A. Single-incision technique misses the anatomical femoral anterior cruciate ligament insertion: A cadaver study. Knee Surg Sports Traumatol Arthrosc 2001;9:194-9. Guler O, Mahırogulları M, Mutlu S, Cercı MH, Seker A, Cakmak S. Graft position in arthroscopic anterior cruciate ligament reconstruction: Anteromedial versus transtibial technique. Arch Orthop Trauma Surg 2016;136:1571-80. Chen Y, Chua KH, Singh A, Tan JH, Chen X, Tan SH, et al. Outcome of single-bundle hamstring anterior cruciate ligament reconstruction using the anteromedial versus the transtibial technique: A systematic review and meta-analysis. Arthroscopy 2015;31:1784-94. Charlton WP, Randolph DA Jr., Lemos S, Shields CL Jr. Clinical outcome of anterior cruciate ligament reconstruction with quadrupled hamstring tendon graft and bioabsorbable interference screw fixation. Am J Sports Med 2003;31:518-21. Williams RJ 3rd, Hyman J, Petrigliano F, Rozental T, Wickiewicz TL. Anterior cruciate ligament reconstruction with a four-strand hamstring tendon autograft. J Bone Joint Surg Am 2004;86-A: 225-32. Taylor DC, DeBerardino TM, Nelson BJ, Duffey M, Tenuta J, Stoneman PD, et al. Patellar tendon versus hamstring tendon autografts for anterior cruciate ligament reconstruction: A randomized controlled trial using similar femoral and tibial fixation methods. Am J Sports Med 2009;37:1946-57. Ubale T, Assudani A, Sangnod PA, Gupta A, Pilankar S, Kale S. Comparative evaluation of functional outcome of transtibial and transportal femoral tunneling techniques of arthroscopic ACL reconstruction. Int J Contemp Med Res 2016;3:2605-7.